A Debi Downer | Get Lifted Girl! Have you let a “fall from grace” define you? I was working on another piece this week and didn’t plan on starting something new. But, I happened to tune into the most recent episode of Iyanla, Fix My Life last weekend and I’m still trying to pick my jaw up off the floor after her interview with former world-class ice skater and Stanford educated Orthopedic Surgeon, Debi Thomas. Despite rising to heights most only dream of, particularly as an African American woman, Debi has given new meaning to the term “fall from grace.” In fact, going from an Olympic stage to being hold up in a bug infested mobile home in Virginia with an alcoholic hillbilly who beats her on the regular, is more like an avalanche-style freefall that slammed her face down onto rock bottom. Ms. Debi has managed to lose her medical career, her practice, every job she’s held, and custody of her only child. Things at the trailer park have gotten so bad, that the local sheriff is frequently called to their home because she and her fiancé Jamie can’t seem to settle on who threw the winning punch and deserves the championship belt. 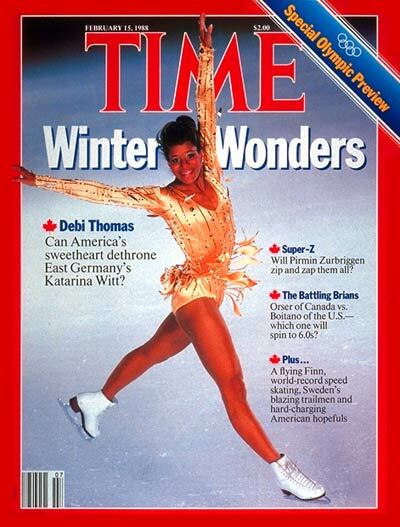 Debi Thomas should be somewhere enjoying a prestigious career and a beautiful home. I imagine she could be coaching young, aspiring ice skaters or teaching a course on molecular biology at an HBCU or an Ivy League school. Yet instead, life for her looks more like a scene from 8 Mile….. Where they do that at? I’m sure everyone who watched Debi Thomas’ interview initially felt like shaking the scrunchie out her head and slapping that flat look off her face while yelling “Wake up girl! Your life is in the toilet, it stinks, and your boyfriend is getting ready to flush!” Yet it’s important to remember that if she is mentally ill, she may not be able to draw those obvious conclusions so we must have empathy. People don’t usually intend to throw their lives away to the degree that Debi did. Most folks’ luck is generally not that bad without significant deficits in perception, emotion, and self awareness, all signs of mental illness. 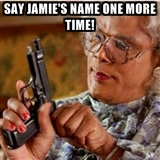 The next thing that made me want to hire the Drop Squad to kidnap Debi was this irrational, blind loyalty she has for her low life fiance’, Jamie. Almost every time Iyanla tried to get her to accept personal responsibility for her choices, Debi was quick to bring up Jamie’s name and discuss his personal struggles instead. Iyanla had to literally tell her, “Don’t talk to me about Jamie” and told her flat out that she used the relationship to distract herself from the hot mess that is her life. It is critical for us women to stop defining ourselves by our relationships to other people. In codependency, both parties enter the relationship from a position of lack so they expect that attaching themselves to someone else will fill internal voids. However, what you typically end up with is a catastrophic clash of resentment, manipulation, anger, abuse and addiction. Those involved in codependent relationships are perpetually empty and pissed off because their loved ones don’t seem capable of making their poor self-image any better. It’s not someone else’s job to make our lives better! Happiness and personal satisfaction will always be an inside job, but the codependent has yet to realize this. Iyanla was spot on when she told Debi that Jamie was addicted to alcohol, and that she was addicted to Jamie. Women who latch on to unhealthy situations can become addicted to the constant push and pull of being rejected and hurt so they can repeatedly experience the “high” of being validated once again by the person they ultimately fear will abandon them. It all stems from a core sense of unworthiness which only God-inspired self-love and acceptance can heal. As much as we’re all tempted to judge Debi for her downfall, we have to be honest enough to admit that most of us have experienced some sort of personal fall from grace. You may have woken up next to the gold-tooth thug you met at the club, or been fired from your dream job. Maybe you had the fairy tale wedding only to divorce a couple of years later or tested positive during a random drug screening at work. Maybe your business failed, you’ve gone bankrupt (is it hot in here?) or you have a mugshot out there that you curse Google for making so easily accessible. None of us are immune from embarrassment and disgrace. Fortunately, we don’t have to worry about our lowest moments being broadcasted in the media so internet trolls can drag us in the Huffington Post comment section. Personally, I don’t believe it’s our failures that are ultimately problematic. Nobody is perfect and we all make mistakes. However, if you let those failures define you and become your reason for staying stuck then you miss what the mistakes came to teach you. Failures can always make us better if we recognize the cause, heal the wounds, and learn the valuable lessons they offer. If you learn you are in an unhealthy relationship, get out. If you discover you have a mental illness, seek treatment. If there is a problem, be brave enough to accept personal responsibility for your errors in judgment and make amends to yourself and others. Unfortunately for Debi Thomas, I’m not sure she will learn from all of this. Iyanla offered her a free apartment away from Jamie and a life coach to help her regain proper perspective and strategize for her future. She did not commit to the help and returned to the trailer park after a couple of months. Jamie was also offered alcohol rehab, but quit his program and returned to their dysfunctional situation as well. It would be great to see one of my childhood role models back on top again, yet it seems she is letting this most recent chapter change her entire story. Watching someone neglect their propensity for excellence and make a conscious decision to live a life of squalor is a travesty and makes this new Debi Thomas a “Debi Downer” for sure. < Previous Hey Single Ladies, One is a Whole Number!